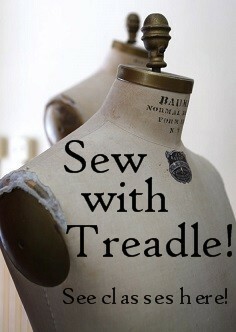 This installment of the Best of Treadle is in miniature today. The ever lovely and talented Rebecca has been spending her free time making a wardrobe for Gene. The year is 1940, the place is Hollywood, California. Whether out for a shopping excursion on Rodeo Drive, or relaxing on her hobby farm, Gene is always ready for the camera. Please keep sending us your photos! We love to share your wonderful pieces with our faithful readers. It's Book Review Corner time again. projects with birds as their theme. This one came in and was gone in the blink of an eye, but we just got in some new copies and I think I need one. The little bluebird is so appealing to me, as well as the bird applique quilt. If you have any books or pattern companies that you would like to see highlighted here on the Treadle Blog, please let us know, and keep sending in your photos of the great work you are all doing out there! Modeling my sister's (a bit too big for me) wedding dress of my own design for her preview. She wears a strapless bra under this dress of Duchess silk satin, taffeta silk, silk organza, bemberg rayon lining all from Treadle Yard Goods. Her fiance and soon to be brother-in-law provided the guitar picks. I painted these a pearlized white and drilled holes in them so that they could be used for embellishment. The swarovski crystals and silver lined seed beads were in my stash.